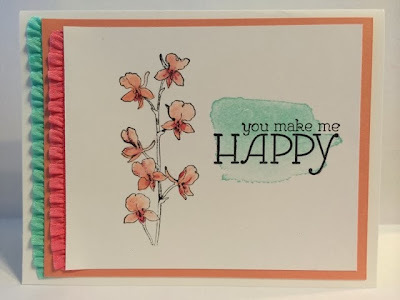 I made this card yesterday using the Happy Watercolor stamp set from the Occasions catalog. I think this set might be a new favourite. Yes, I know, I say that a lot. How about, it's my new favourite until something else becomes my new favourite? The card was inspired by Rachel Tessman's example. I think it's a perfect card for today since the sun makes me happy after yesterday's blizzard.